In case you haven't noticed, hot sauce is the condiment of the moment. Everything imaginable comes in Sriracha flavor, and chefs are inundating our palates with stronger and spicier flavors every day. 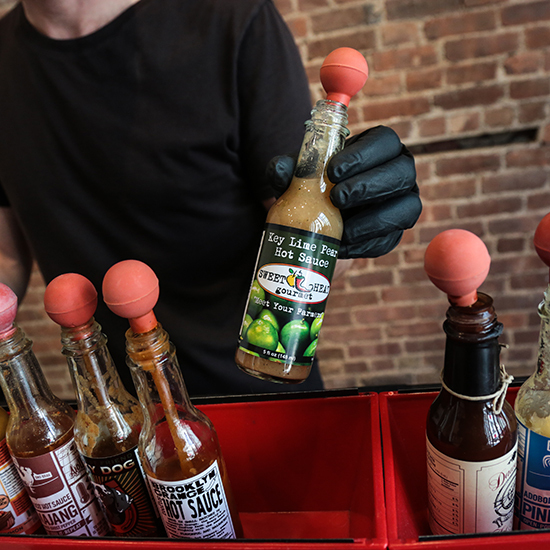 The newly opened Heatonist in Williamsburg has no interest in becoming a pawn in the arms race to burn off all our taste buds with Carolina Reaper peppers. Instead, owner and self-proclaimed hot sauce sommelier Noah Chaimberg is focused on finding hot sauces he can actually use—ones that will make food taste better, not just hotter. He will even help you pick out a sauce matched perfectly to your palate. Here, Chaimberg recommends three of his favorite rare and odd sauces, in addition to offering up some ideal pairings. Pair with: Milk—that’s right, you mix it straight into a glass of regular 2 percent to make a spicy chocolate milk.